One reason games take so long… you keep re-implementing stuff, as you learn how to do things and your standards improve. Case in point: hands. 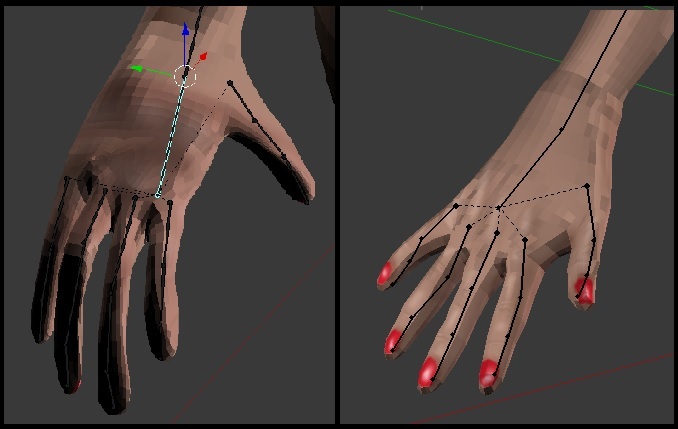 When I first modeled the hands (on the left), I knew the modeling wasn’t good, but I was happy just to have hands. But for some reason I decided to redo them, and I’m absurdly happy that they look much better. As so often, the key is to have a good reference. The first time I was following a drawing of the whole figure; this time I used a reference illustration of just hands. I also drew a better texture. Plus, a technical Blender thing: in both cases, I made the fingers by extruding a square from the palm. But this time I extruded non-adjacent squares. That left a gap between the fingers, which is, you’ll note, how hands actually work. Of course, I’d used the same model for several other characters, and the work had to be propagated to each one. The same sort of thing seems to happen in professional game development– witness this description of the making of Bioshock, which suggests a) a game is made and remade multiple times over the course of its development, and b) you should probably never work for Ken Levine.